The Tu-16 was a high subsonic medium bomber developed in the Soviet Union. Its development was started in 1950. Its first flight was made in 1952 and its delivery in 1955. The Badger was produced by the Soviet Union in a large quantity.In September 1957, the USSR adopted a program of assistance and the development of Chinese armed forces. To strengthen the Chinese Air Force several Tu-16 Badger medium strategic bomber were transferred. Since 1963 the Xi'an Aircraft Factory began to retrofit the H-6 aircraft according to the Services' operational requirements and several improved versions were developed. However, with growing tensions between the USSR and PRC shipment of the planes was halted and the Chinese industry began producing the BADGER at the Xian and Xian Aircraft Company Aero-Engine Corporation. H-6 is a designation for the Chinese manufactured aircraft. In December 1968, the first Chinese bomber H-6 Badger took off. China and had 32 BADGERs in the operational inventory by 1972. A total of around 120 PLA-AF H-6E/I and 30 PLA-N H-6D Badgers were built between 1968 and 1990. China's Badger production ramped up during the 1970s and slowed down post 1990 when the last four H-6Ds were exported to Iraq, with spares being an ongoing export to support Egypt's Soviet supplied Tu-16Ks. The aircraft has a slender and streamlined fuselage. The wings of the Badger are mid-mounted, swept-back, and tapered with blunt tips. There are fences on top of the wings and its landing gear pods extend beyond the wings' trailing edges. The Badger's engines are two turbojets mounted in wing roots which extend beyond the leading and trailing edges of the wing root. The engines also have round air intakes. Its fuselage is long, slender, and bulging where the engines are mounted and tapered to the tail. It has a round, glassed-in nose and a stepped cockpit. The tail is swept-back, tapered fin and flats with blunt tips. The Badger also has a tail gunner compartment. In addition to normal training missions, 4th IR aircraft have been used for a variety of secondary missions. BADGERs were used extensively in 1970 for air defense exercises in Northeast China. Both BULLs and BADGERs have been associated with special weapons programs. In addition to participating in nuclear tests both as drop aircraft and in air sampling roles, BULLs and BADGERs had been photographed in the air-to-surface missile area of the Shuangchengtzu test center. Proficiency of the BADGER force as a whole was initially assessed by US intelligence as fair for medium to high-level daylight bombing and poor for night operations. The H-6 does not have a low-level capability. With continued training, the BADGER force reached a high degree of proficiency in high altitude bombing under instrument flight conditions. However, the BADGER is extremely vulnerable to modern air defense weapons systems and would have been hard-pressed to survive in the air defense environment over the Soviet Union. Early in the 1970s China made an attempt to develop an indigenous strategic bomber using British-made Rolls-Royce Spey turbofans. After abandoning this project due to technical and financial difficulties, China launched a program to reengine the H-6 bombers with the Rolls-Royce turbofans, but cancelled this project as well for financial reasons. Although China upgraded the avionics and ­electronic-countermeasures systems of its 1950s-era H-6 bombers, the PLAAF did not acquire a long-range strategic bomber capable of projecting airpower beyond the Chinese mainland during this period. China reportedly halted production of the H-6 in 1982. By 2005 the backbone of China's bomber fleet was approximately 120 H-6 intermediate-range bombers, supplemented by Q-5 and JH-7 fighter-bombers. The H-6, the largest of China's bombers, has a weapons payload of 20,000 pounds, compared to the American B-52's 60,000. The operational range of the H-6 is also significantly smaller than that of the B-52, restricting the aircraft's operations to the Pacific. China's medium bomber force did not initially have an air to-air refueling capability, though it was within the PRC's technical capability to develop one. By the mid-1990s five Chinese H-6D bombers had been converted into air-refueling tankers to allow China's warplanes to reach well into the South China Sea. In addition, the H-6 aircraft had been successively retrofitted into a flight test bed for testing aero-engines by the Flight Research Institute, a carrier aircraft to carry a high altitude and highs speed pilotless drone and a defensive counter-measure aircraft for the military services. The PLA Air Force is equipped with several dozen of special-purpose electronic aircraft, including a few specially modified Hongdian-6 medium bombers which have been equipped to support electronic warfare operations. However, the PLAAF remains some 15 years behind world standards in this field. 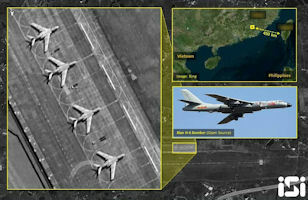 On 04 March 2019, Israel’s geospatial and geo-intelligence solutions provider ImageSat International (ISI) uploaded several satellite images taken on March 1 via a social media platform, declaring that for the first time in few years, four Chinese H-6 strategic bombers were detected in Xinning airbase in east China's Guangdong Province. ISI also revealed that the airbase is about 450 kilometers from Taiwan. The Taiwanese media conjectured that H-6 bombers would not be deployed permanently at Xingning airbase given that the airbase is stationed by other PLA Air Force units. The newspaper also revealed that Taiwan's "defense authorities" published news about PLA’s H-6 bombers on February 27, saying that "a fleet of H-6 bombers conducted regular long-distance flight training on the afternoon of that day, setting out from a coastal airbase in Guangdong Province of the Chinese mainland and patrolling the South China Sea before returning to the airbase." It conjectured that the Guangdong coastal airbase is probably the Xingning airbase.